Miami, FL, May 15, 2013 – Today at its annual meeting with PBS member stations, PBS KIDS announced the premiere date for the upcoming animated preschool series PEG + CAT. The multimedia property follows the adorable, spirited Peg and her sidekick, Cat, as they embark on adventures, solve problems and learn foundational math concepts and skills. PEG + CAT premieres Monday, October 7, 2013, on PBS KIDS with a special one-hour broadcast of two back-to-back episodes, along with integrated online and mobile content. The series airs daily following the premiere (check local listings). PEG + CAT was created by Billy Aronson (Rent, Postcards from Buster) and Jennifer Oxley (Little Bill, The Wonder Pets!) of 9ate7 Productions, and is a production of The Fred Rogers Company. Each episode features a story in which Peg and Cat encounter an unexpected challenge that requires them to use math and problem-solving skills in order to save the day. Their adventures take viewers from a farm to a distant planet, from a pirate island to a prehistoric valley, from Romeo and Juliet's Verona to Cleopatra's Egypt to New York's Radio City Music Hall. While teaching specific math lessons, the series displays the value of resilience and perseverance in problem-solving. PEG + CAT is a multiplatform media experience that includes interactive mobile and online content. The property offers games and other resources online at pbskids.org/peg, and additional interactive features, including more games, streaming video, parent and educator resources and a mobile app, are slated to launch along with the on-air premiere in fall 2013. 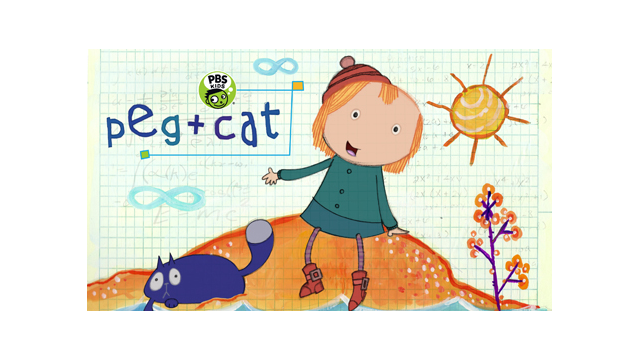 PBS stations across the country will also bring the series to their local communities by providing PEG + CAT educational resources for families. PEG + CAT is funded in part by the U.S. Department of Education through the Ready To Learn Initiative, a program that supports the development of innovative educational television and digital media targeted at preschool and early elementary school children and their families, and by the Corporation for Public Broadcasting (CPB). PEG + CAT is the first original preschool transmedia property developed as part of the federal Ready To Learn Initiative. PEG + CAT is part of PBS KIDS’ ongoing commitment to helping kids build the skills they need to succeed in school and in life. PBS KIDS serves young audiences wherever they live, learn and play — through educational apps, on TV, online and in the classroom. Images, episode descriptions and additional press materials for PEG + CAT are available on PBS PressRoom. The company was founded by Fred Rogers in 1971 as the nonprofit producer of Mister Rogers’ Neighborhood for PBS. In the years that followed, it not only created hundreds of episodes of this much-loved program, but also extended Fred’s values and approach to other efforts in promoting children’s social, emotional and behavioral health and supporting parents, caregivers, teachers and other professionals in their work with children. The Fred Rogers Company continues to build on Fred’s legacy in innovative ways through a wide variety of media, and engaging new generations of children and families with his timeless wisdom. For more information, visit us at www.fredrogers.org. The Corporation for Public Broadcasting (CPB), a private, nonprofit corporation created by Congress in 1967, is the steward of the federal government's investment in public broadcasting. It helps support the operations of more than 1,300 locally owned and operated public television and radio stations nationwide, and is the largest single source of funding for research, technology and program development for public radio, television and related online services. The Ready To Learn Initiative is a cooperative agreement funded and managed by the U.S. Department of Education’s Office of Innovation and Improvement. It supports the development of innovative educational television and digital media targeted at preschool and early elementary school children and their families. Its goal is to promote early learning and school readiness, with a particular focus on reaching low-income children. In addition to creating television and other media products, the program supports activities intended to promote national distribution and effective educational uses of the programming, community-based outreach and research on educational effectiveness. The contents of this release were developed under a grant from the Department of Education. However, those contents do not necessarily represent the policy of the Department of Education, and you should not assume endorsement by the Federal Government.